general structure of SQL queries later. attribute, so we put that in the select clause. 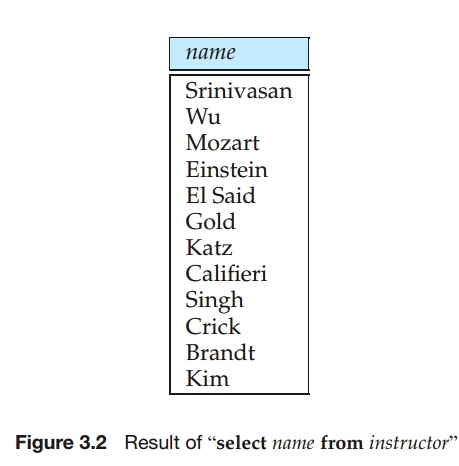 the preceding query is shown in Figure 3.2.
query is a relation containing the department names, shown in Figure 3.3.
department name at most once. shall use distinct whenever it is necessary. 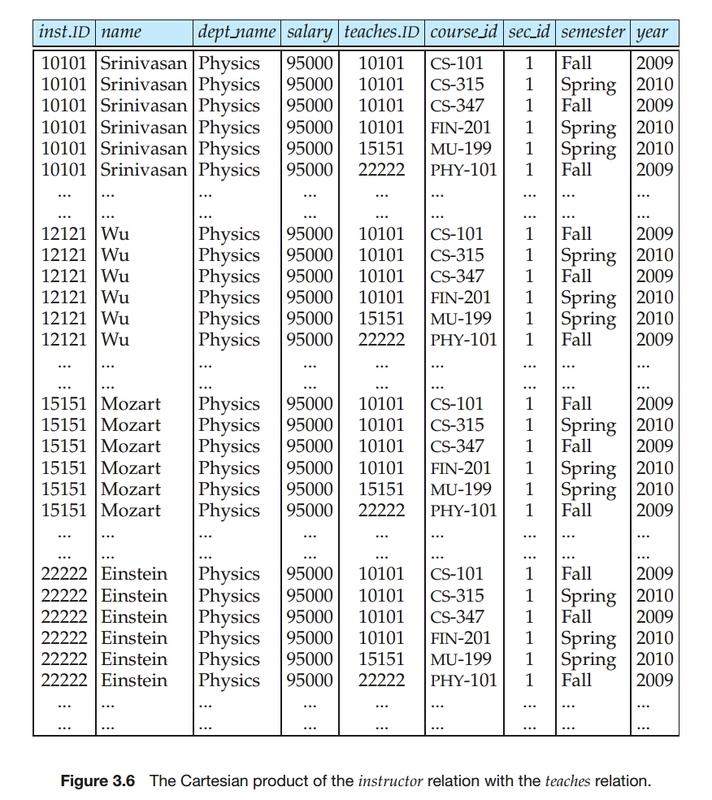 from the preceding query is shown in Figure 3.4.
special types, such as date types. information from multiple relations. We now study how to write such queries. 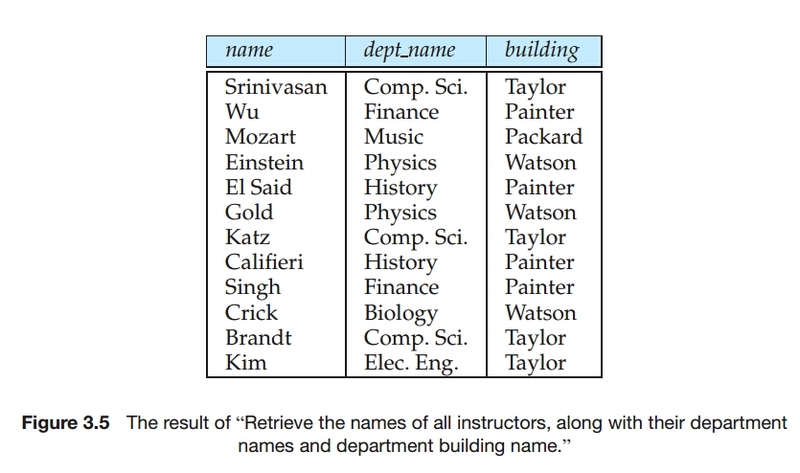 the department relation whose dept_name value matches the dept_name value of the instructor tuple. 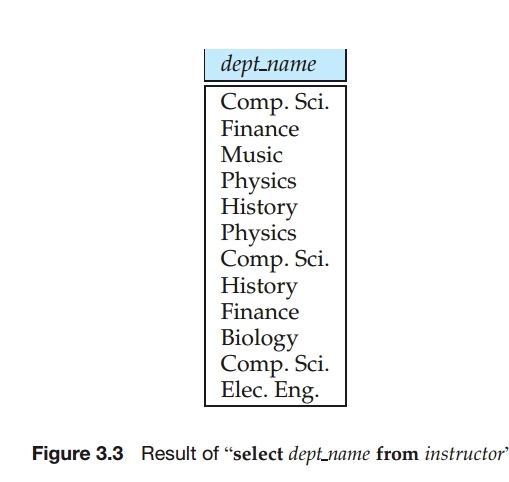 respectively, then the result of this query is shown in Figure 3.5.
department, and the relation name is used as a prefix (in instructor.dept_name, and department.dept_name) to make clear to which attribute we are referring. In contrast, the attributes name and building appear in only one of the relations, and therefore do not need to be prefixed by the relation name. We now consider the general case of SQL queries involving multiple relations. • The select clause is used to list the attributes desired in the result of a query. clause is omitted, the predicate P is true. clauses in operational order: first from, then where, and then select. The result relation has all attributes from all the relations in the from clause. 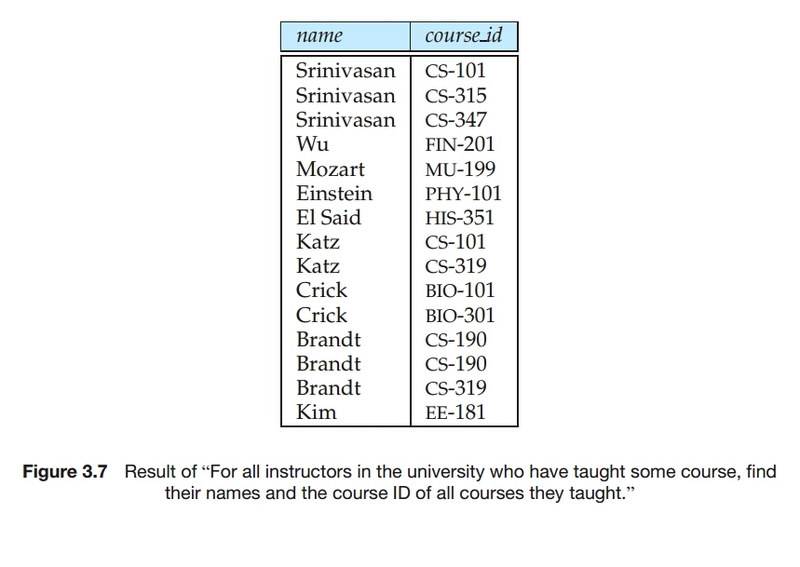 Note that the above query outputs only instructors who have taught some course. such tuples, we could use an operation called the outer join. have not taught any course, do not appear in the above result. where clause, as shown below. could have used just dept_name, instead of instructor.dept_name in the above query. 2. Apply the predicates specified in the where clause on the result of Step 1.
expressions) specified in the select clause. query, it would output the Cartesian product, which could be a huge relation. 120,000 tuples in the result.